When the Love Lydgate Committee realized that the “September Song” concert in memory of Eric Watts had actually generated a profit, I was asked to suggest a suitable lasting memorial for him. Nonplussed, I turned to the family and they came up with a bench in the open land behind the White Hart where Eric liked to walk. Used mainly by people walking their dogs and children letting off steam, it is the nearest thing to a park in Lydgate. I am told by somebody who grew up in Lydgate that Canon Airne, a well respected vicar and historian, was instrumental in persuading the authorities, probably then West Riding County, to gift the land to Lydgate because the rowdy youths of the area needed somewhere to congregate and fool around and to stop them making a nuisance of themselves. My daughters insisted at first that the bench should be made of wood because woodworking was Eric’s hobby. After all he made the Lydgate flower box by the bus stop and the much loved “WELCOME TO LYDGATE” sign at the crossroads. 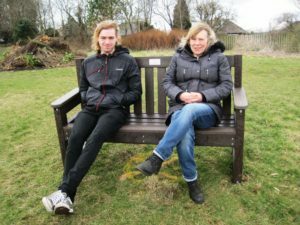 However, a wooden bench in such an exposed area would need continuous maintenance and so we found a bench made from re-cycled plastic bottles that was robust, looked good and was also good for the environment. Installed by a very helpful environmental team from Oldham Council, it is sited overlooking the playing field and a very nice view, particularly on a good day. 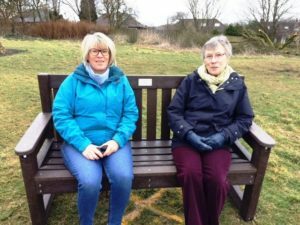 The dog walkers are delighted and are making good use of it and, hopefully, when the weather improves, the parents and children will also appreciate it. It does look a little bit lonely, as if it needed a companion. A picnic set might be good for the area or a few things for children to play on that are in keeping with the environment. Just an idea!